Over the last few years, I have taken several trips to Haiti. Our church has participated in sponsoring an orphanage, and we even started a new 501c3 called the Haitian Children’s Ministry. This ministry is a passion of mine. I was in Haiti a few weeks ago and was on the campus of Mission of Hope, Haiti. Mission of Hope is a wonderful organization that is doing some tremendous things in that country. One of the most significant things they do is deliver 93,000 meals every day to children in orphanages and schools. I was able to visit the warehouse where they keep the food and witnessed first hand the children being provided the meals. The sad fact is that there are still 70,000 more children on Mission of Hope’s waiting list. If they had the capacity to distribute more food they would. When I came back from Haiti, I wanted to be a part of that effort to get these 70,000 kids off the waiting list. 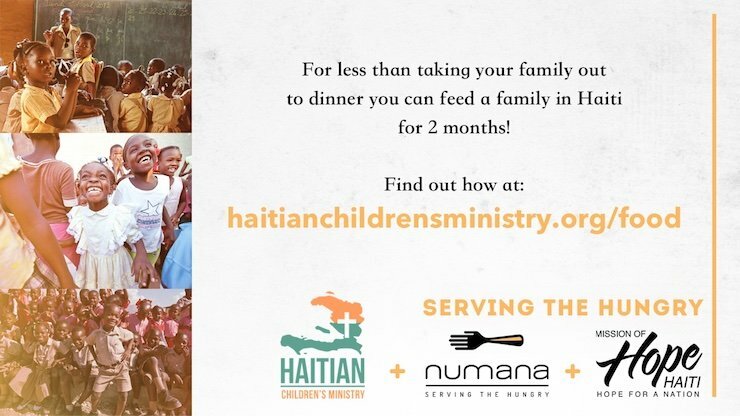 We contacted another organization called Numana that works with Mission of Hope to provide a portion of these meals. On June 3 we are planning a meal packing event with Numana in our community (Old Bridge, NJ) that will generate 20,000 more meals for Mission of Hope. We need to raise $6,000 to make this event a reality. These 20,000 meals will be packaged in 93 boxes. That means each box will cost approximately $65. That is less than what it costs me to take my family to dinner at a nice restaurant. But with this $65, I can feed a family in Haiti for two months. This is where I ask for your help. If you live in NJ or a bordering state, you are welcome to join us on June 3. I realize that most people reading this will not be able to physically join us, but I ask if you might prayerfully consider helping make this happen by donating to purchase one of the 93 boxes. For every 30 cents donated, one more meal is packed for a child in need. My hope is that we will be able to package much more the 93 boxes. I am praying that we could at least double that number. But it is 93 boxes that are the minimum we need to make this happen. The number of boxes we can pack is based on the funds we will be able to raise. Again, thank you for your prayerful consideration. God’s blessings. UPDATE: Due to the overwhelming response and generosity of so many, we have set a new goal of 80,000 meals. We are thrilled to be able to feed even more children. Thank you for your help.